Owners of luxury sailing yachts, working fishing boats and traditional wooden gulets have for decades been drawn like magnets to the gleaming turquoise waters of Croatia’s rugged coastline, so it’s little wonder that the country now rates as one of Europe’s top hotspots for holidays by the sea. Yet, despite the rise in her visitor numbers – nearly 14 million tourists last year – Croatia has not given in to mass tourism, and you don’t have to venture far to discover remote lighthouses, secluded coves and, inland, pristine farming communities nestled below towering mountain peaks. So, what is it about Croatia that is so appealing and special? Croatia is actually made up of a staggering 1,185 islands and islets, of which just 50 are inhabited. With over 2,600 hours of sunshine per year, Croatia is one of the sunniest places in Europe! Although virtually all the tourists to Croatia flock to her 3,598 miles of coastline, 44% of the country is covered in forest, with 10% protected by National Parks. In a recent study conducted by Harvard University, Croatia was ranked as the 6th cleanest country in the world. Croatia’s drinking water is the highest quality (100%) of any in Europe. Croatia has its own alphabet, or set of letters, called the “Glagolitic”. Along with the Latin alphabet, it was in daily use from the 9th until the 18th century. The tiny Croatian village of Grubine – in one of the country’s poorest regions, Zagreb – holds the world record per capita for owning a Mercedes! At the last count, the 800 inhabitants owned no less than 117 of the luxury cars! The first ever tie originated in Croatia and dates back to the 17th century when wives and girlfriends gave their soldiers a narrow scarf to wear around their neck to keep them safe and distinguish themselves from other armies. The French modern day word for this is “cravate” stemming from “Croate” meaning Croatian. In 1777, Dubrovnik, at the time an independent state, was the first country in the world to recognise the USA as an independent country. Croatia holds many Guiness Book records: the smallest town in the world (with just 23 inhabitants) is Hum; the smallest cathedral in the world is in Nin, near Zadar; the oldest theatre in Europe was built in Hvar (in 1612) and, in Pula, the amphitheatre is one of only three in the world where gladiator fights took place! 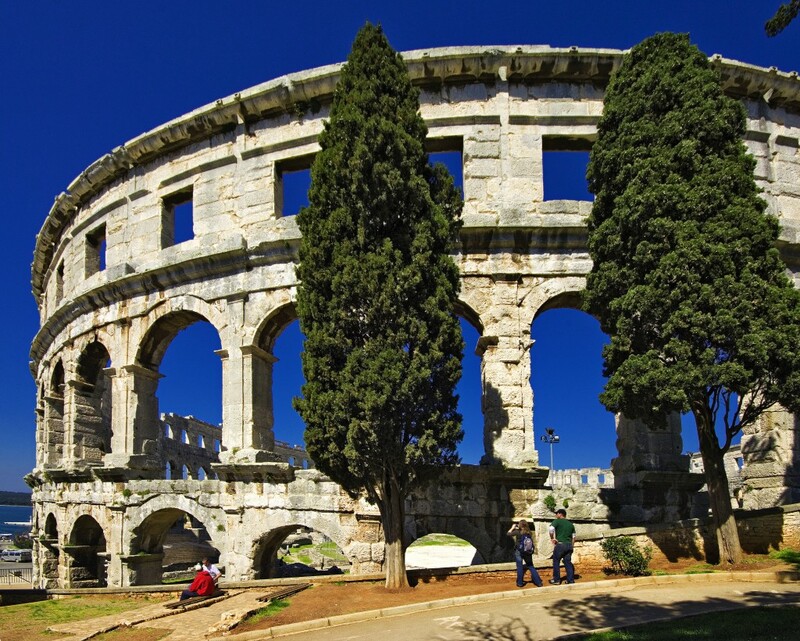 Discover fascinating historic sites throughout Croatia. It’s clear that the history, culture, art and traditions of Croatia are as diverse as her coastline and natural landscapes. We encourage you to visit now before the rest of the world wakes up to what she offers – details of our walking holidays and cycling holidays can be found here, we hope to meet up with some of you there this summer!